Raisin Toast: Sweet Tea Anyone? 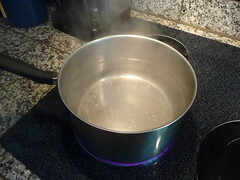 Bring the 8 cups of water to a boil in a pan that has a handle so you don't burn your hands, and your arms, and your toesies later. 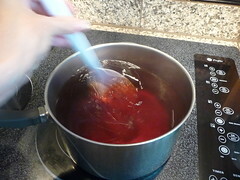 Then, remove it from the burner so it stops boiling. 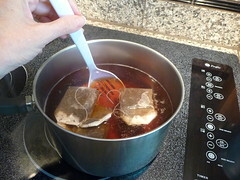 Add the 4 tea bags. 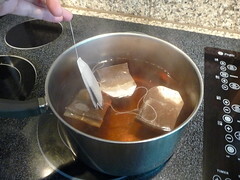 Don't do this while the water is boiling or you will get some weird tastin' tea. Don't forget to take off the paper tabs at the top of the string either. 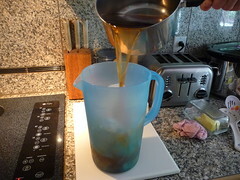 If you don't, they will stick to the bottom of the pan and make for a very dissatisfying batch of tea. I know. I've done it. Stir this difficult concoction for about a minute. Maybe 45 seconds. Weeeellll, maybe 30 seconds. 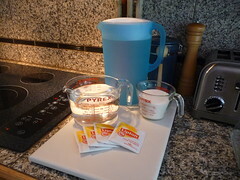 Then remove the tea bags and make a good aim for the trash can. If you miss, then shuffle over to the floor and the wall and pick them up, feel silly about your bad aim and remember how lousy you were playing basketball in high school, and throw them neatly into the trash. Add that cup-a-sugar. The cheering begins! Hurray! Hurrah! Alleluia! Angels Singing! Swweeeeettt Tea for the masses. 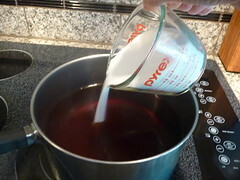 Now stir it until all that sweet stuff is dissolved. Your pan had better not be on that hot burner or I'm going to have to make you start over and you don't want that now do you? Please ignore all the crap piled up on our stool and the dishtowels slung over the side of our sink - pay attention will ya! This is important stuff I'm sharing here! 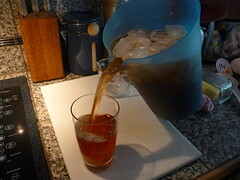 Now, sheesh, I'm filling the pitcher with ice - all the way to the tippee tippee top. Next you holler for your Big Bear and ask him to pour the hot tea into the pitcher of ice, because if anyone is going to burn themselves, it is going to be him. Plus, he is big and strong and he likes to feel useful during this tutorial. Oh, and please ignore the pink rag on the counter that I used to clean up my mess. I'm good at making a mess. Unfortunately. 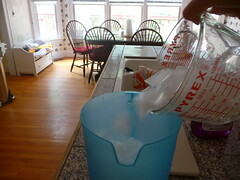 Now doesn't that look yummy for quenching your thirst on this hot summer day? I thought so. But boy is it sweet! 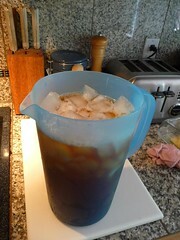 Of course, if you can't handle all that sweetness like us Southern folk, you can adjust it to your liking. Now have some will ya! It's enticing, delicious, thirst quenching goodness. Then go make yourself a burger to go with it.